Weddings are all about love and themes! From the bridesmaid dresses to the table centerpieces, everyone and everything must be in theme. This includes the details of the bride’s jewelry, the bouquets, the weddings favors, and the cake topper. After the bride, the cake is likely the second most photographed detail on the day of the wedding. The layers of moist cake and yummy buttercream frosting create a beautiful focal point in the venue and it gives guests a sweet treat to look forward to. 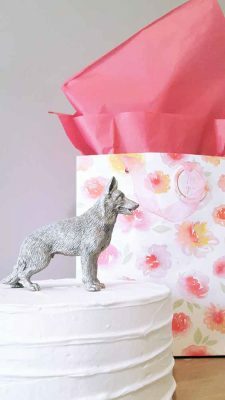 At the top of the cake will sit a cake topper. This represents the love of the bride and groom. The representation can be a symbol (like a heart), a word (like love), or the couple or couple’s family (dog included). Most importantly, this cake topper, like everything else, must stay in theme. That’s the trickiest part; to find the perfect cake topper and also have it match the vibe of the cake and wedding. That’s where we can help! We custom paint figurines, specifically dog figurines, at the request of the married couple. It’s extremely common these days for brides and grooms to want to include their dog on their wedding day. 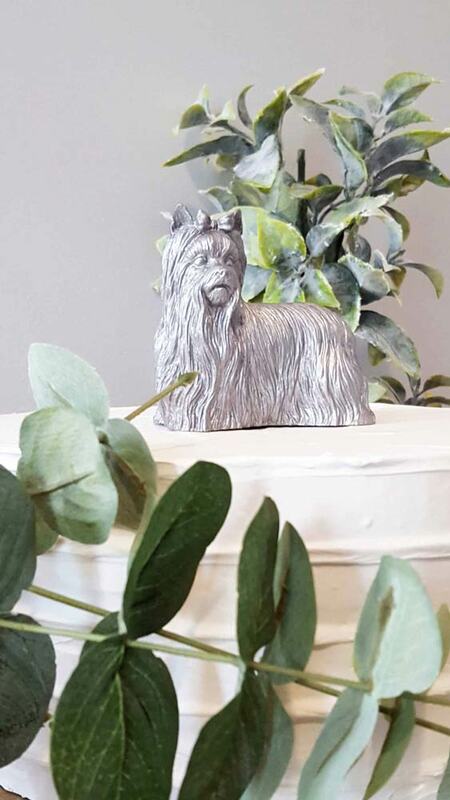 One way to do that is a dog cake topper. We can custom paint any dog breed figurine to be any color you wish. From silver to gold, white to pink; we will custom paint your figurine to perfectly match the theme of your wedding and be flawlessly incorporated into your day. The process is easy, and easy is what you need when you are already planning a billion other details for your big day. You simply click the links below, which will bring you to our dog figurines that are offered in two different sizes. You then select your breed, and which color you would like your figurine to be painted on the product page. If your option isn’t shown, be sure to contact us! We can paint it any color you wish. 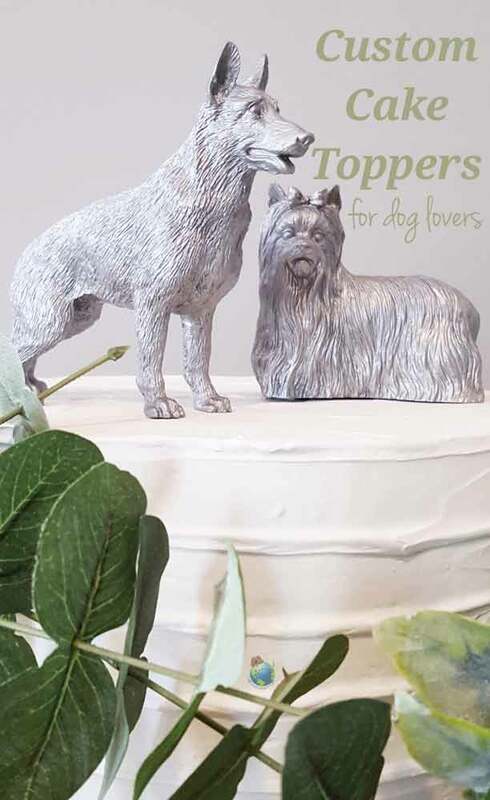 Before you go, here’s a TOP DOG TIP: These figurines can be placed upon any cake, not just wedding cakes. Think: birthday cakes, retirement cakes, congratulatory cakes, and more!